Sold! The William Hill House, established at Hickory Hill, Martins Dam, circa 1928 in Upper Merion Township, Wayne. 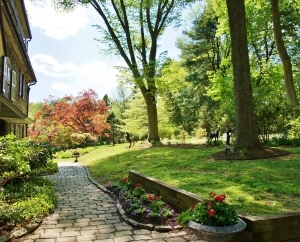 Built as the summer-estate for Dr William Hill and his family, this picturesque property provided an escape from the hustle, bustle and heat of 1920's Philadelphia. As a summer retreat for Philadelphia's elite society, this very special property is part of Main Line history. The period architecture of this home reminds us of eras past with warm, cozy spaces, thick stone walls, rich hardwood floors and exceptional mill-work. Nestled in a magical setting amidst a canopy of hickory trees ... this is the opportunity to own your own private Main Line retreat and be the next steward of this property's storied history!